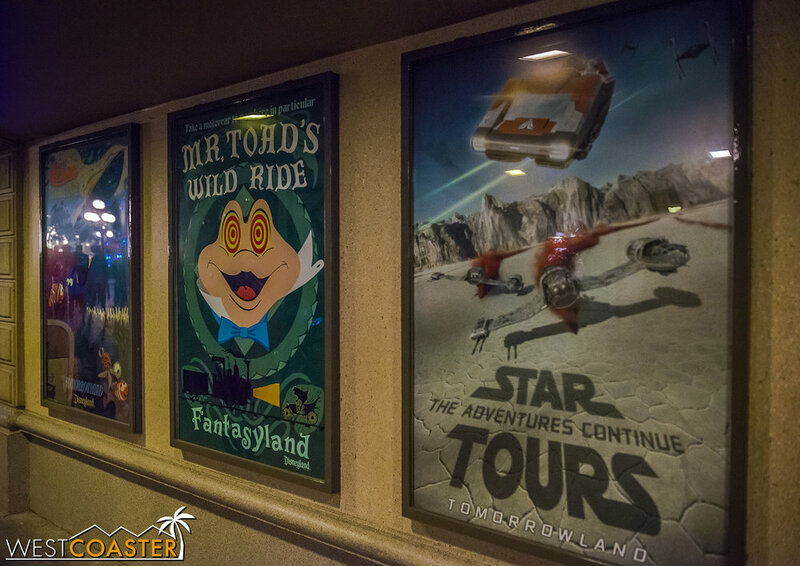 Oh my Porg, folks, it's a Disneyland update! We've only had like... three of them in the past three months. Well, now that Halloween season has wrapped up, we'll be a bit more regular about these things. So without further ado, lets get to it, shall we? Last Friday, Disney provided some additional information about what guests will be experiencing in a galaxy not that far far away at all, including the name of the remote, galactic outpost planet never before seen in Star Wars canon. Batuu will be Galaxy's Edge to which the themed land refers, and it be a haven for those looking to get away from the attention of galactic authorities. 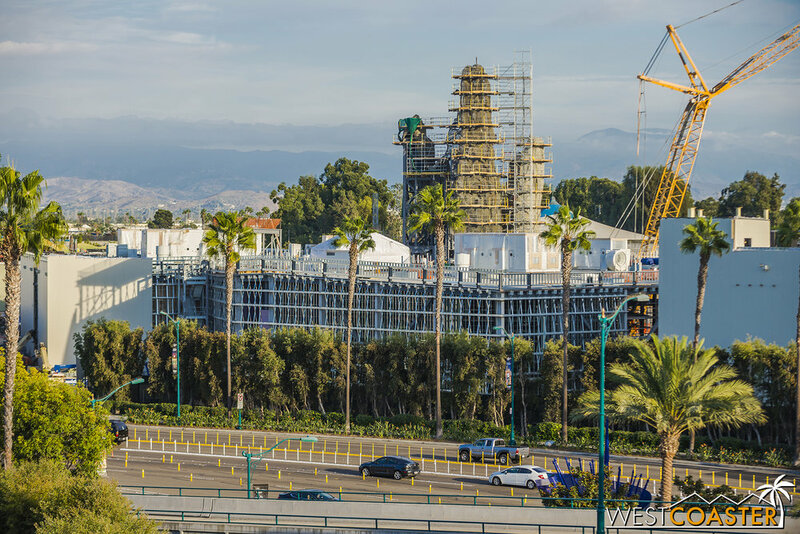 Meanwhile, at the northwest side of Disneyland, the Galaxy's Edge is taking very tangible shape in the form of a rapidly completing building facade wrapping around the First Order ride building and the Millennium Falcon attraction building. 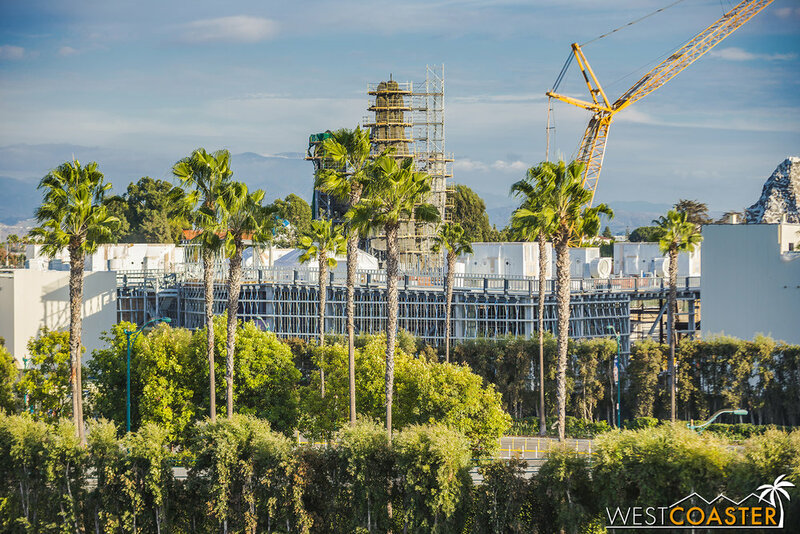 In addition, the towering peaks of Batuu are taking shape more and more. 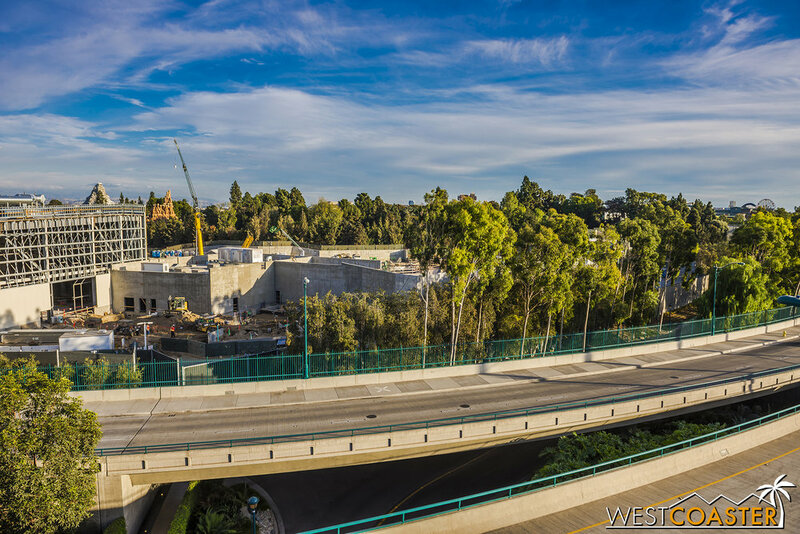 Meanwhile, construction seems to have picked back up more over by the Critter Country side of "Star Wars" Land. This side will be more rustic and forested--both to blend into Critter Country and the Rivers of America more, and to serve as a wilderness base for the Resistance group fighting against the First Order. Speaking of which, the descendants of the Empire will be clustered more on the Frontierland entrance side of Galaxy's Edge, which will be more urban and active, with markets and shops and greater activity and buzz. Just a year and a half to go! And they're moving at lightspeed. It's November, which means the coming winter skies yield dramatic scenes in the afternoon! More whispy clouds means some good sunsets this time of year! 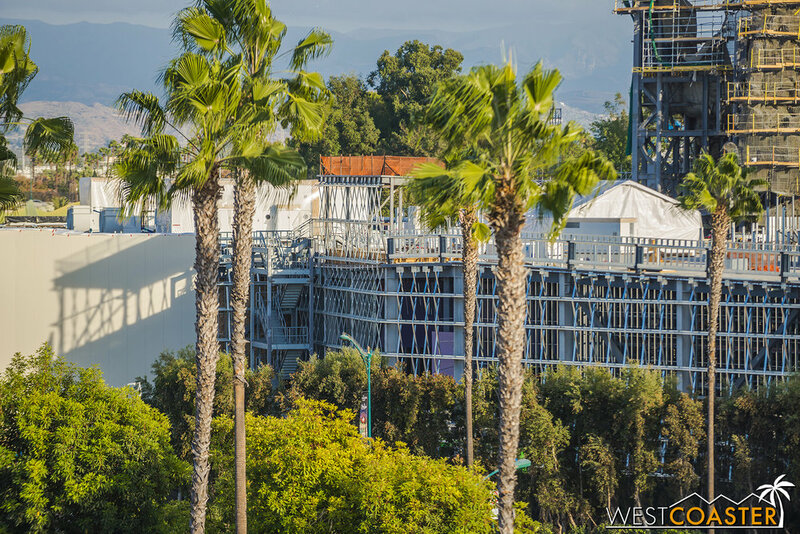 Oh, and also, there's a "Star Wars" Land continuing construction or something. It's cool, and something something Dark Side something something Force something? Hey, remember when this was all empty dirt? Yeah, that was just the start of this year. 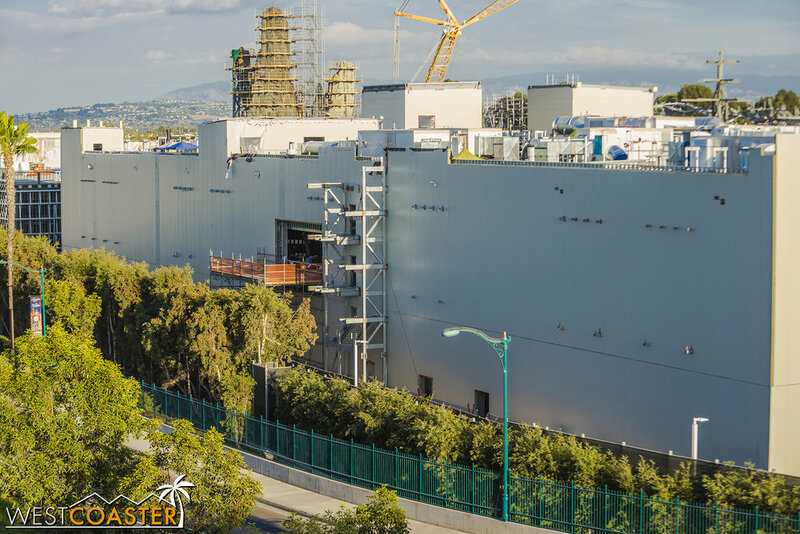 Now, Star Wars: Galaxy's Edge (not sponsored by Samsung) is very much a collection of massive structures. Although the cranes are still up, most of the structural steel of the Millennium Falcon and First Order buildings has been completed. They're in the light gauge framing and "cover them up" stages now. Meanwhile, their roofs keep on getting more and more crowded with equipment, but we'll come back to that in a moment. Lets look at the Millennium Falcon ride building first. Those turntables have been full covered now. And they're installing wall panels along the perimeter of the building too. In the foreground is the First Order building, and the metal straps and horizontal ledgers are part of Millie. They've also been tossing air conditioning units and other mechanical equipment on the roof of the Millennium Force building. They're building up several areas along the parapet higher, perhaps to screen larger equipment. And then there is the massive northwest face of the First Order building. And one massive, gaping, proton torpedo-accepting hole. The opening has been very intentionally maintained. The scaffolding makes it look temporary, but the framed headers just inside the opening make it seem very deliberate and long-term. I don't see any lift here, though. It might be obscured. Or it might be what the trussed structure on the right will also support. Meanwhile, on the roof, it's duct and package unit city. 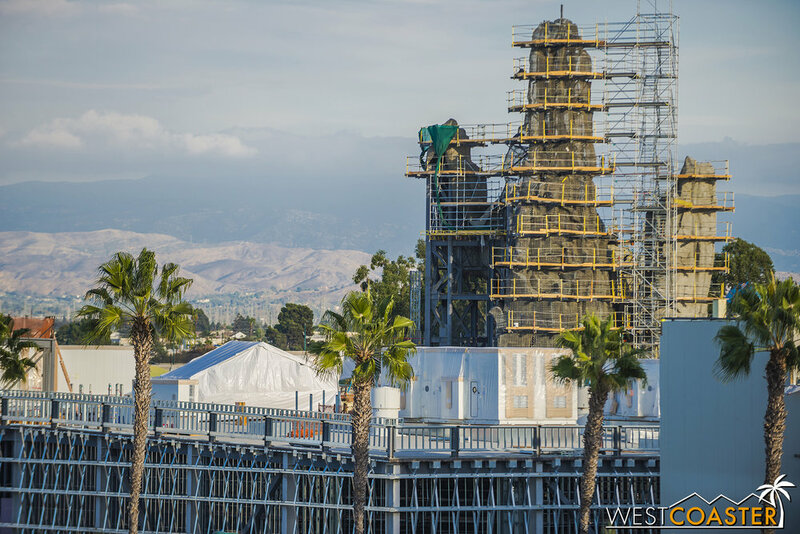 In addition, framework for more future rockwork spires is going up! A little over, the massive mechanical penthouses are being covered up. Ride plans uncovered by the Orange County Register found a reference to a "Kylo-vator." 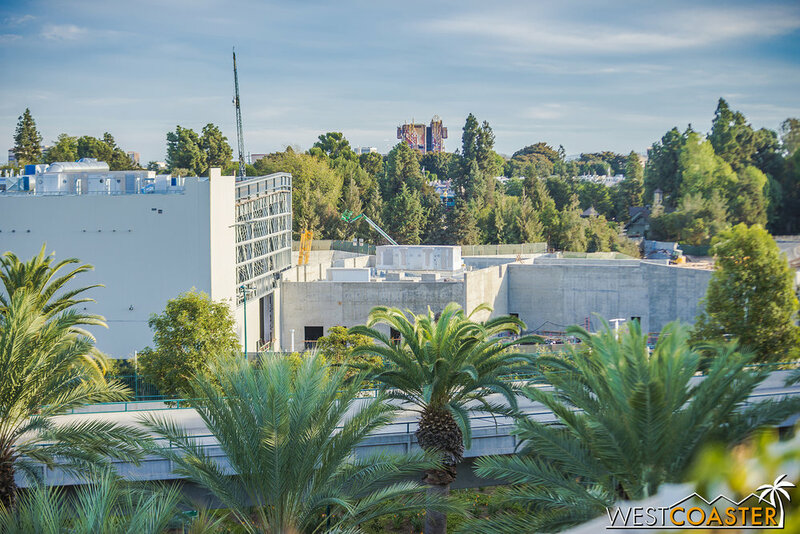 I've always thought these penthouses looked light giant ride-vehicle sized elevators that take the carriages from the first level to the second (and vice versa) while maintaining some sort of show element--similar to what happens on the Transformer ride at Universal Studios. More steel for future fake rocks continues getting assembled. It's nice to know that it won't just be the three clustered together at the Millennium Falcon building! On the southwest edge of the First Order building, a close-up of the ductwork really gives an idea of how massive everything is. A person could easily walk through that round duct with just a bit of a hunched posture. It's that big! And monumental is the name of the Star Wars expansion game. The rocks are the most obvious sign of the scale of this massive project. And they're starting to be painted and finished. They'll provide a backdrop for the Rivers of America well before Batuu comes close to finishing up. As large as the mechanical units are (they're shipping container sized--or even a bit larger), the rocky spires dwarf them. They're covering up the southwest side too. Just a bit more on this part, and the ride will be practically fully enclosed. Looks like there will be another large maintenance opening provided here, though. Possibly a large roll-up or sliding barn door here. A smaller man door to the left can be seen in the outline of what's been "cut out" of the wall paneling. 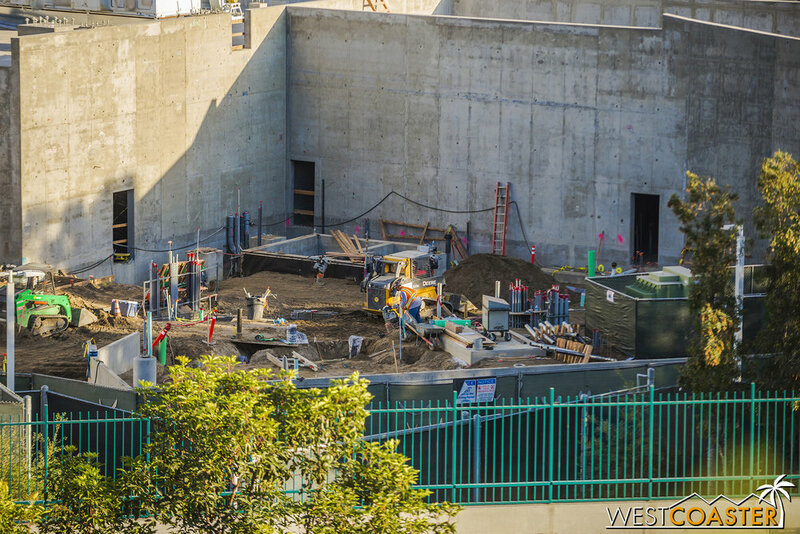 The cast in place concrete buildings south of the First Order ride building are continuing work. They're sealing off the land, providing an architectural barrier to the outside world. We can see some bit of earthwork at the Critter Country entrance. Some new concrete forms being laid down. And new walls continue to be formed in the direction of Critter Country. As I mentioned earlier, this side of the land will be home to the Resistance. Back of house areas here, continuing to get worked on, with plenty of utilities sticking up. This could end up being the main power center supplying the whole land. 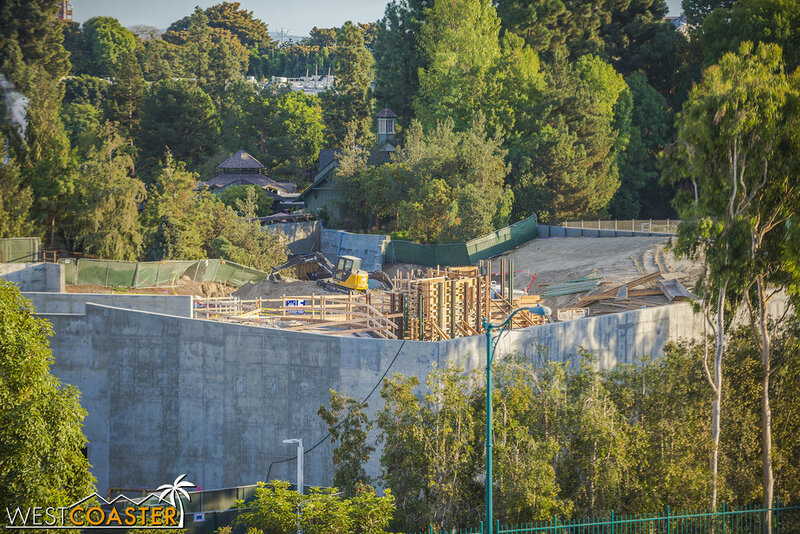 Lets jump to Tarzan's Treehouse and look at how things appear to be progressing from inside the park. Look at all that scaffolding! The rocks are turning out pretty nice. But Disney really knows how to do fake rocks! 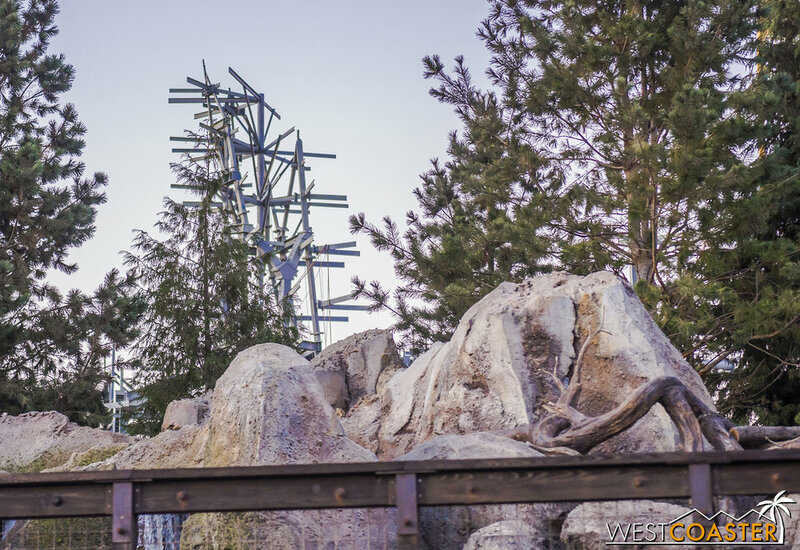 The peaks peek out past the trees of Frontierland. More structure is readily visible rounding the Rivers of America. This gives a sense of the forced perspective Star Wars: Galaxy's Edge will provide to the Rivers of America. 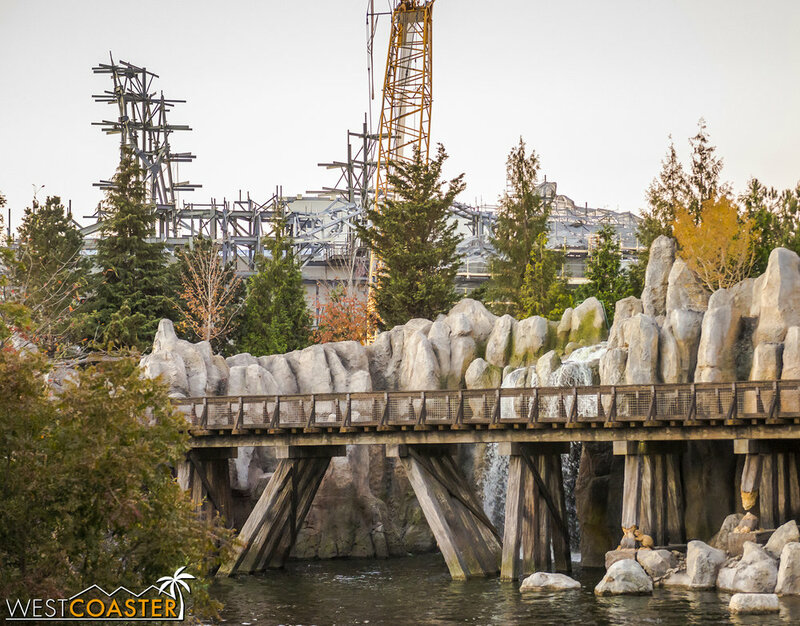 You can only see this great extent from the Mark Twain or Columbia as it rounds the far end of Tom Sawyer Island. 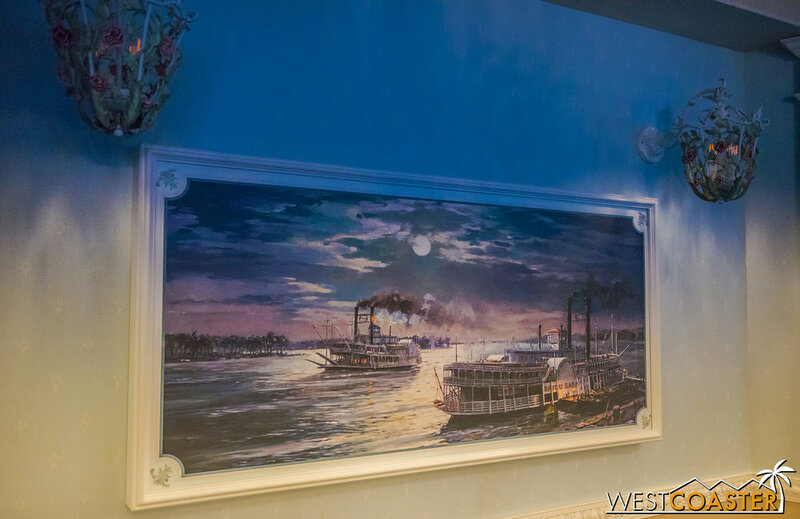 And probably some of this from Tom Sawyer Island itself. But there will be a nice distant mountain layering effect here once everything is said and done! 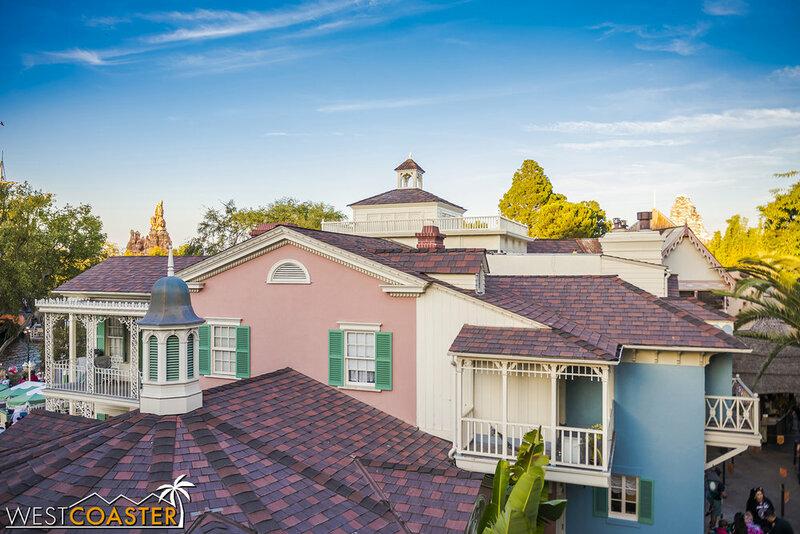 This past weekend, the River Belle Terrace had soft opens, following its refurbishment and kitchen renovations. 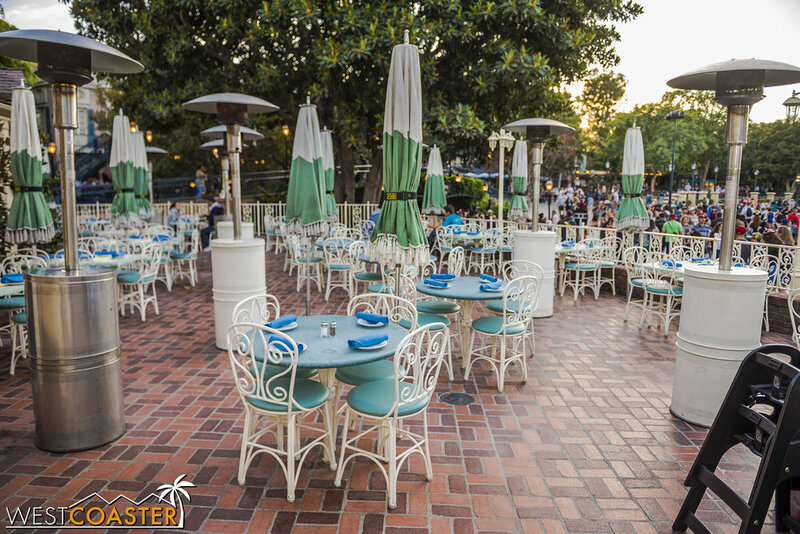 The restaurant is actually largely the same--sit-down style, with reservations to be required once the soft open period is done. The menu features much of the same barbecue based fare as before, but the seating and interiors have been freshened up. This project was more infrastructure improvements than any dazzling makeover, but it's nice nonetheless. Hey, the River Belle finished its refurbishment! The roof is all done. Looks like the tiles are nice and new (or new looking) too! New paint... it looks spick and span! The restaurant was not formally open last Friday, but it was accepting walk-up visits to help with staff training. There outdoor patio didn't have any drastic changes, but it looks nice. Here's the menu. Mostly the same. It's pretty spacious, in that there's a fair amount of open circulation room. The furnishings are fine. Nothing special, really. And not much really appears to have been done from an interior design standpoint either. Just paintaings and other wall-hung decorations to liven up the walls. Nothing particularly rich or immersive. It is what it is. The announcement of Batuu wasn't just a white whale for Star Wars fans to salivate over until 2019. Batuu became a very real and accessible destination in the form of a new scene in Star Tours. But that wasn't the only addition. Inspired by the upcoming movie, The Last Jedi, Star Tours added an epic battle through the planet, Crait, to its line-up of scenes guests can experience. This adaptability has proven to give exciting updates and increase re-rideability to the classic Tomorrowland attraction, and following up on previous additions, such as the Jakku fly-through scene, shows that Disney is pretty serious about continuing the movie/attraction connection for the foreseeable future! Star Tours continues to get itself into trouble joining other planets' space and air battles. New scenes featuring Batuu and Crait are available now! Meanwhile, over at Downtown Disney, construction on Splitsville continues humming right along. 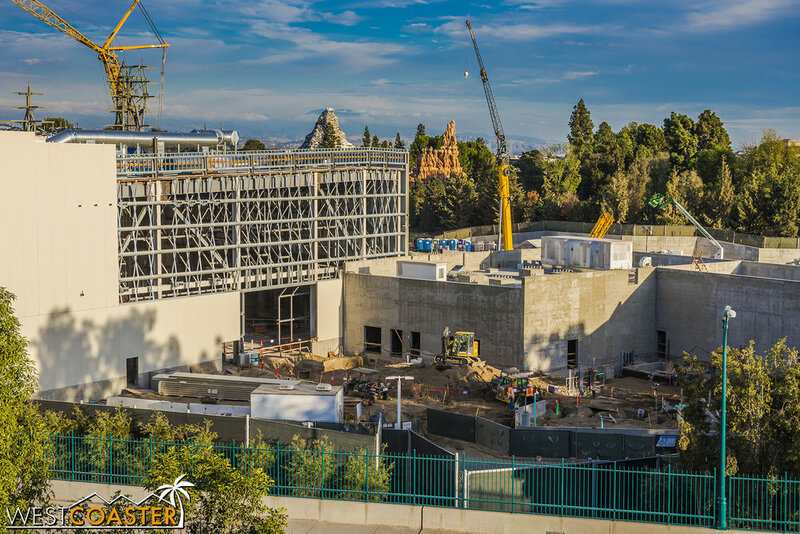 The building enclosure is growing more and more complete everyday, and the aesthetics are starting to become pretty prevalent. 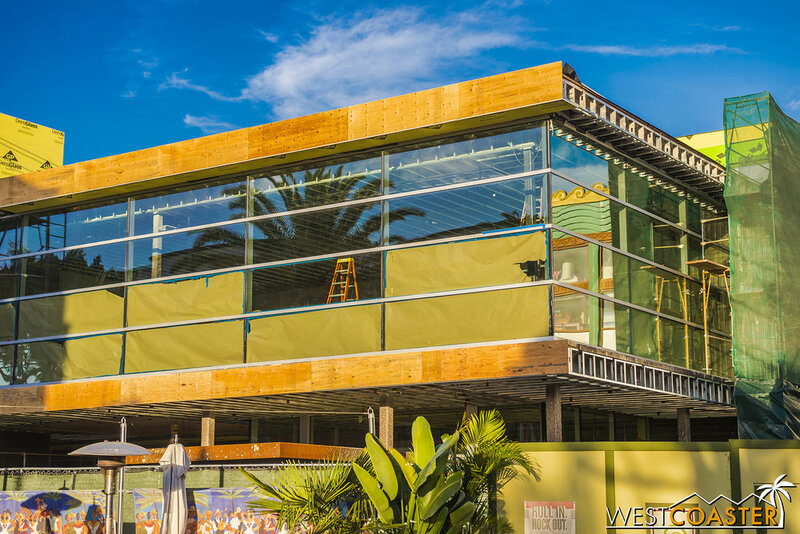 With sleek glass curtain walls and retro mid-century angles and horizontals, this bowling alley is sure shaping up to be a hip looking hangout. I don't see it open before the end of the year at its current pace, but by the early part of next year, it should be open and rocking business! 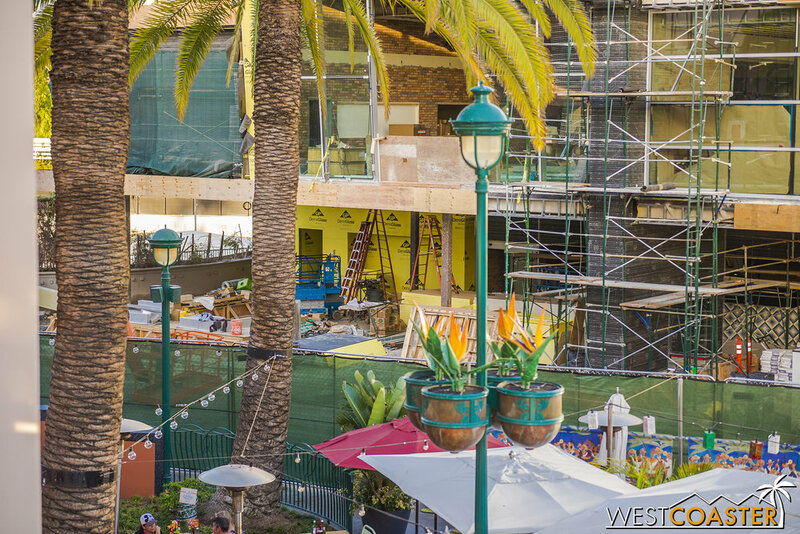 Check out the former home of the House of Blues! 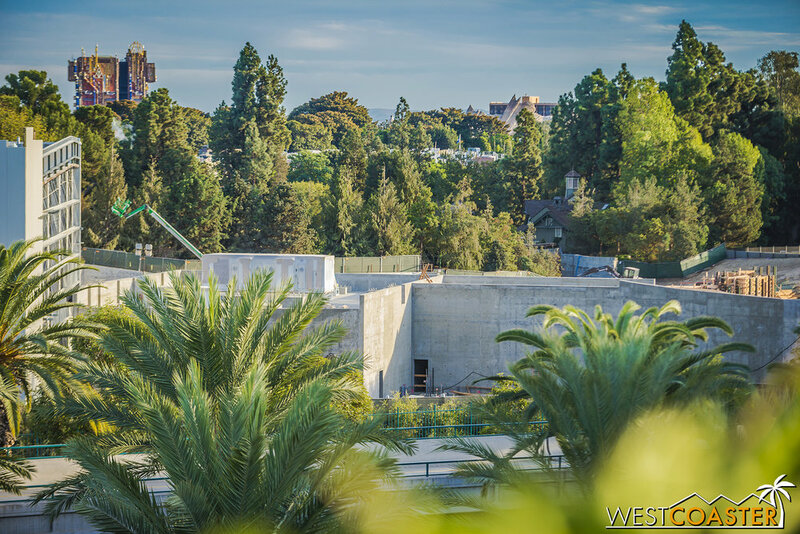 The form of the building is coming into place! The glass is almost complete at the second floor. It didn't seem like too long ago that this was just steel. The entry canopy hasn't been covered yet. But they've started putting up some stone veneer on the second floor. They're moving along pretty speedily. Looking back toward the main walkway of Downtown Disney. Some ceiling framing has gone in at the interior. Lath has been applied around this blocky wall. There are plenty more walls that need to be installed, though! But it's coming along nicely! 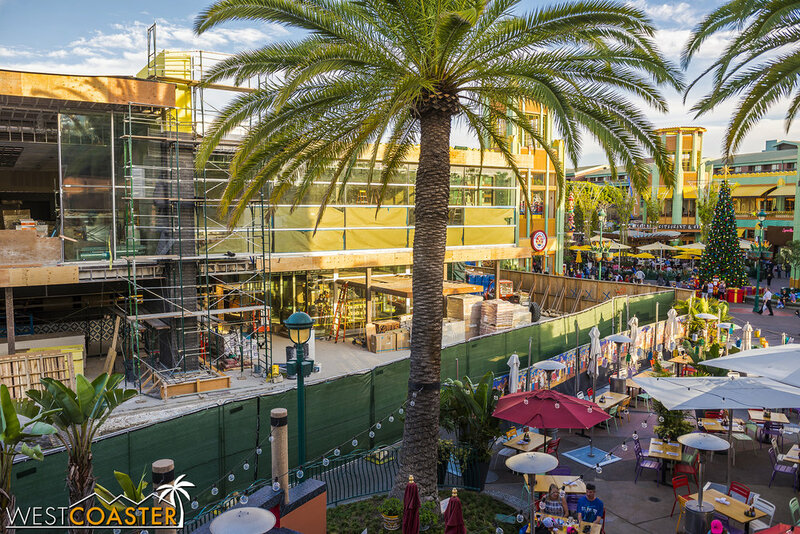 A big Christmas tree has gone up at the center of Downtown Disney. It's part of the festive seasonal decorations. No Star Wars AR yet! No more Anna and Elsa either. I think this formally marks the end of the Frozen craze. 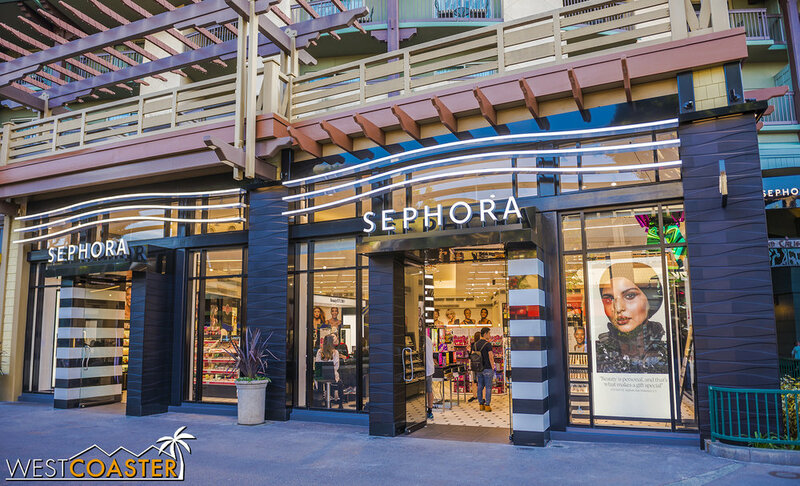 And Sephora's facade now looks a little more ripply textured. Earlier this month, we also saw the fall iteration of the biannual Dapper Day unofficial Disney dress-up event. This popular event continues to grow bigger and more mainstream--so much so that Disneyland is cashing in and starting its own nighttime version early next year (one that is more aimed at the original roots of Dapper Day, geared at a mid-century flair rather than the Disney Bounding that now dominates the day). Hey, it's fun to dress up and go to the parks and to see others decked out in their finest or Disney-inspired creatives, and there's a positive vibe all around. The next Dapper day is Sunday, April 22, 2018, but here's a brief look at what Fall 2017 Dapper Day was like. This couple Disney Bounded as the Jerrod Mayuyama Kingdom of Cute versions of Dole Whip and Mint Julep! A villains power group on full display. A stylish Ariel, complete with mermaid pencil skirt. Everyday is Halloween for this Nightmare Before Christmas Disney Bounding group! Disney Bounders come in all styles. Sometimes they're linked just by color. 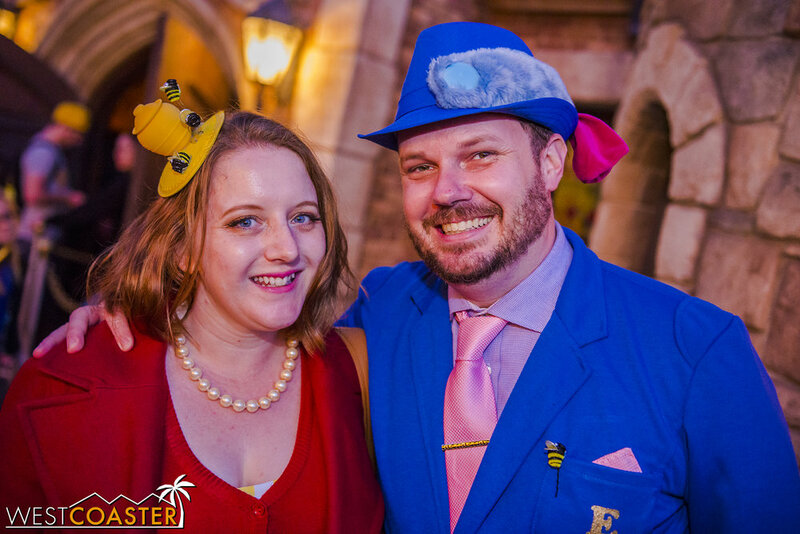 Of course, not all Dapper Day attendees were Disney Bounders. Some chose to dress up more in traditional dapper attire. But these days, Dapper Day is a lot more dominated by Disney Bounders like this Incredibles duo. The Mad Hatter and Alice. Back to front, Chernabog, Sorcerer Mickey, and a broom create a Fantasia trio! This lady was very, very committed. There's a Snow White vibe going on here. The Disney Muses came as dapper Emperor's New Groove characters. Their friend, Monica (left) completed their group, and they found another Emperor's New Groove inspiree! This adorable couple brought a Donald and Daisy spin to things. 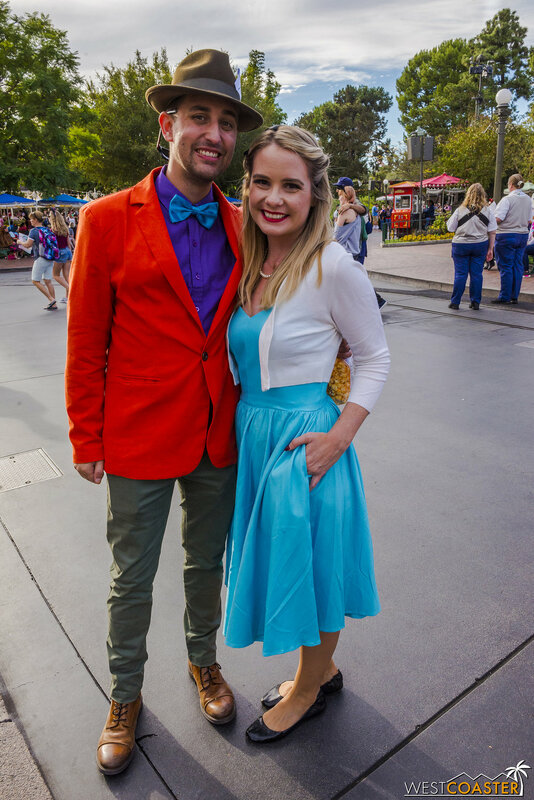 Meanwhile, this group was celebrating Dapper Day and an in-park engagement! Once again, I ran into Phyllis Herman, who was exceptionally pinked out with cupcake and unicorn and pig hat. This Jack and Sally pair made for a most adorable Disney Bound couple. And there was also Donald and Mickey gender bending. Cosplay Parents (sides) were also on hand, Disney Bounding as Up's Carl and Ellie, along with their friends. This Winnie the Pooh couple showed off their Disney creativity. "Olaf" and "Sven" looked especially radiant. And fellow Disney [hobbyist] photographer Todd Young and his wife seemed ready for Disney's upcoming Disney After Dark "Throwback Nite!" 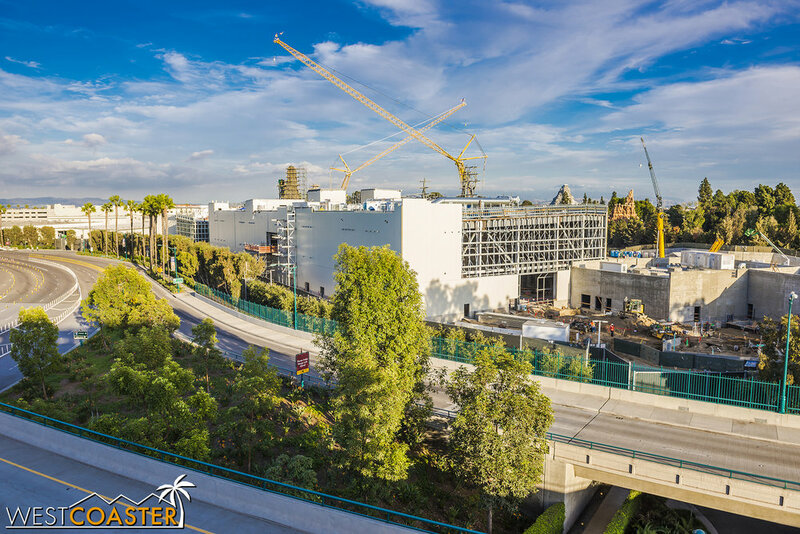 That does it as far as general park updates go for the Disneyland Resort--at least for this week. But we'll be back soon with a look at this year's winter holiday festivities at both Disneyland and Disney California Adventure. Christmas time is arguably the most magical time of the year to visit the parks, and of course, the Resort is once again decked out in its holiday finest, with plenty of attractions and special events to mark the season.